I know I don't say it much anymore, but DQ has a very special lunchtime place in my heart. I love putting away the troubles and tribulations of work for a few minutes and enjoying an ice cold blended treat. 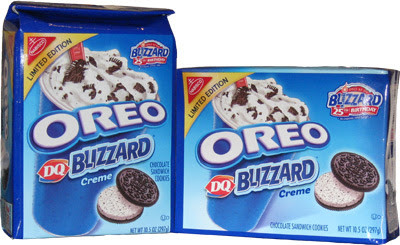 Well, when I walked by the giant display of Limited Edition DQ Blizzard Creme Oreos, how could I say no? Come on, how could you walk buy these and not throw them in your shopping cart? ...and then I tried one. 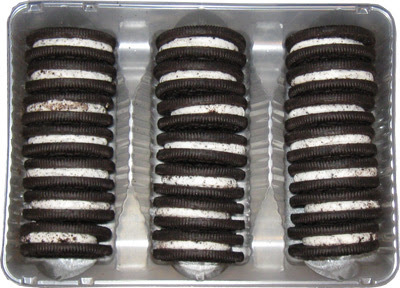 After waiting a whole two hours since I bought these cookies, my dreams of blizzardy oreo awesomeness were dashed by the swords of artificial nastiness. This doesn't taste like a blizzard. It doesn't even taste like an oreo. It tastes like chemicals, nasty chemicals. I tried just the creme. Yuck. I tried to stick two sandwiches together. Nope. I don't know if it's on purpose but the wafers are super crunchy too. 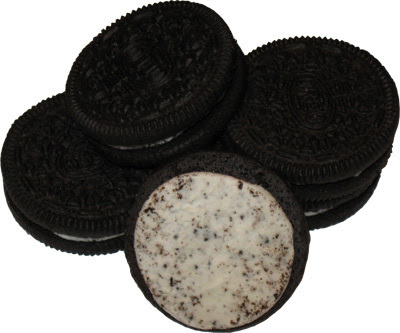 Maybe I've been spoiled by Country Choice, but these Oreos are just plain nasty. June 2011 Update: Weird, apparently Target has brought these back "exclusively" for a limited time. I assume that means after that time, they will be available everywhere. If you want, click here for a $1 off two coupon. I do like them, they don't taste like a Blizzard but they are good. The trick is to freeze them!!! HA! Never thought of that!